What does the Hamas movement in Gaza have in common with the Republicans in the U.S. and the Tories in the UK? Well, according to some, they all can fairly be characterized as politically “conservative”. Reem Raiyshi, 22, A mother of two from Gaza City makes a video statement for Hamas days before blowing herself up, killing four Israelis and wounding seven others. The acclaim is not quite universal, however. Some conservative Islamic groups, including Hamas, disapprove of the western-style Arab Idol. And, only a month ago Sherwood similarly characterized Hamas as a “conservative Islamic group” in another report on the Arab Idol contestant. The Israeli-Palestinian conflict is “insoluble” and most Israelis “couldn’t care less about it any more”, according to Naftali Bennett, the surprise star of the election campaign, whose extreme rightwing nationalist and pro-settler Jewish Home is within sight of becoming the country’s second biggest party. Indeed, there seems to be something of a trend in imputing political extremism to Israeli Jews due merely to their city of residence, as the following sentence in Sherwood’s April 4 report about an outbreak of violence in the West Bank indicates. After the funeral Palestinian youths threw stones at Israeli soldiers close to an extremist Jewish settlement in the heart of [Hebron]. Whilst in previous reports Sherwood has described Hamas a “militant Islamic group” or an “Islamist group”, her recent work suggests movement towards such shameful moral inversions, by which Jews living on the ‘wrong’ side of the green line are “extremists”, while a radical Islamist movement whose leaders have openly called for genocide against Jews are merely “conservative”. As we’ve noted on many occasions, one of the more disturbing elements of the Guardian Left ideology is this increasing tendency to grotesquely distort ordinary language in an attempt to shape political reality. It’s difficult to overstate the political toxicity of such activist journalism, which attempts to convince the public that a movement advancing a racist, violent ideology should arguably evoke greater moral sympathy than the Jews who represent the object of their malign fixation. Yup, Hamas will be announcing a coalition with Nick Clegg, next. Just a few disagreements about gay marriage, etc, to be ironed out. I thought they were already in partnership – Hamas and LibDems. Hamas might iron it out in the literate term. In exactly the same way when Dana won the Eurovision contest for the same reasons ..she got the votes to wrongfoot the UK …she spoke out against violence and the ” conservative ” IRA did not like it..they were conservative in the sense of not wanting progress…yes it was also murderous anti social and abusive but it too was conservative. when Dana won the Eurovision contest for the same reasons ..she got the votes to wrongfoot the UK …she spoke out against violence and the ” conservative ” IRA did not like it..
What’s this – some new conspiracy theory? Well, let’s see where shall we begin? Why reserve special terminology like “extremist” for Jews who live east of the Green Line? After all, you all know that they live there, right? Why not also call them “conservative?” After all, they wish to conserve the status of Jews living in Judea and Samaria, right? I guess that you don’t mind it if Harriet treats you like a child. Precisely, Rosco. Conservatism doesn’t refer to a particular set of beliefs but to beliefs that are considered traditional in a particular place at a particular time. Some Palestinian Muslims, including some members of Hamas, oppose non-traditional aspects of Arab Idol. They are correctly referred to as ‘conservative’ in this respect, whatever other characteristics they might have. Gun lobbyists in the US or opponents of gay marriage in the UK could also be termed ‘conservative’, although they are unlikely to regard TV singing competitions as immoral. Sencar and Burns kissing each others arses: “Precisely, Rosco. Conservatism doesn’t refer to a particular set of beliefs but to beliefs that are considered traditional in a particular place at a particular time”. Come on, you can do better than that you couple of pompous middle class Brits. You have a propensity to sympathise with those like Nick who like to make Nazi analogies about the Jews, why not use the Nazis as an example of conservatism, as in the context of wishing to conserve Germany’s status as a world power following their defeat in World War One. Such a bunch of cowardly apologists for racists and murderers you two turn out to be. Wouldn’t be cricket to use the Nazis as a comparison, as just like Hamas, anti-Semitism is central to their ‘conservative’ doctrine and world view. At least Rascal Burnout have famous in-laws. Sencar is just a famous nobody. Conservatism doesn’t refer to a particular set of beliefs but to beliefs that are considered traditional in a particular place at a particular time? So that would mean Hamas belife that Israeli should be wipe out is conservative? Iosif Vissarionovich Stalin is many things. He’s a mass murderer, a maniacal dictator, a one person catastrophe for the peoples of the SU and Eastern-Europe, and a very bad father of his children. In an article about Svetlana Alliluyeva (his daughter) I wouldn’t characterize her father as the famous example of bad parenting even it would be correct in the context of the topic. If you and I were discussing Stalin you would say “Stalin …colluded with Hitler and then and only then fought the Nazis.” You would not say ” Stalin the multi mass murdering -self styled- communist dictator of the USSR, …colluded…. ” You would expect me to know who Stalin was. This article is expecting the Guardian to spoonfeed its readership and as a criticism is just luke warm pap . The Guardian should only be attacked when there are serious issues otherwise any such criticism is counterproductive. Most G. readers will indeed know who Hamas are. So why give them a description at all, you might ask? OK. But if you are going to describe them, then surely “conservative” would be an inaccurate term. “Conservative” is being used in conjunction with” disapprov(al) of the western style programme” and is clearly not intended as a single word description. How about the reason why Assaf may be asking for political asylum to preserve his limbs? That would mean talking about Hamas belifes something which I am sure our “friends” here prefer to avoid. No wonder you are such a pathetic turd. Blame it on your dad. BTW, was he as famous as your in-laws? Are you being deliberately obtuse, pretzelberg? It is Hamas’ attitude to singing contests that is ‘conservative’, as is obvious from the context. Those Islamic hardline freedom fighters of a demons you so love might come and haunt him. How conservative do you have to be to object to a singing contest? This is a joke in desperate need of a punchline. For me the Guardian attempts to hide from its readers the true face of Hamas is a very serious issue. Most of if readers are brainwashed ignoramuses exactly because they got their information only from the Guardian, BBC etc. Try to find in the Guardian and/or in the BBC any word about today’s rocket attacks from Gaza. Characterizing Hamas as simply conservatives is exactly the tactic used by these media sources to blurring the picture – many of their readers have no idea about Hamas’ actions and main characteristic: a racist and murderous terror organisation pursuing a medieval ideology. As I said above , the word “conservative” was being used in its proper context. Amongst the many terms that can be applied to Hamas …terrorist , murderous, abusive..one is conservative and you are attempting, as the article does, to suggest ( by the use of the word “simply” ), that Sherwood was intending the word “conservative” to describe Hamas in an overall sense. “Simply” not the case . You hate the Guardian ( who doesn’t ? ) but we will get nowhere making up phoney attacks. …that Sherwood was intending the word “conservative” to describe Hamas in an overall sense. She did exactly that. If her readers know what Hamas is she doesn’t need to use any description at all. If she wants to summarize for readers who don’t know the organisation then using the “conservative” attribute is very deceptive and characteristic of the Guardian whitewashing of Palestinian terror. It is not an attribute ie there is no evidence that she is attempting to sum up Hamas as” conservative “. You and the author are trying to suggest she is deliberately trying to minimise the evil side of Hamas when she is commenting on their attitude to modernity as opposed to their tendency to kill civilians. You do this for good reason in that she has made some crazy suggestions previously. But suspicion is not proof. . The word conservative in the context that it was used is not only the right word. It is the only word. Try the word ” terrorist ” and it does not fit the context. Adam is a reasonable ,occasionally very good writer.But he has missed in this instance.It happens. Rosco this dialogue has became very boring. You are just repeating yourself being unable to acknowledge your initial mistake. Facts are facts: either the “conservative” attribute in Sherwood’s article is absolutely redundant (the readers know Hamas) or deceptive (the uninformed readers won’t know that Hamas is a terror organization). You and the author are trying to suggest she is deliberately trying to minimise the evil side of Hamas when she is commenting on their attitude to modernity as opposed to their tendency to kill civilians. Yes Rosco, she is deliberately attempting to hide the true nature of Hamas because it contradicts the Guardian worldview. But suspicion is not proof. Yes it is for every reader who knows the history of Sherwood’s (and the Guardian’s) many other attempts to do exactly the same. I don’t think that I have anything more to add to this discussion so you must excuse me when I put an end to it from my part. Don’t do it .Life is worth living even if your argument is crumbling. As for your insistence that she is saying Hamas are conservatives in the wider sense we can agree to differ. But logic would dictate that nobody who is a Hamas lover would ever use the term conservative as it is an insult hence either she does not like Hamas or you have missed the point. I lean on the latter. Exactly. The context being the Guardian’s history of downplaying the extremism of Hamas, its charter, its aims, and its M.O. The article exposes the double-standard employed by Ms. Sherwood and her paper by juxtaposing it with their wholesale labeling of Israeli extremists quite tenuously through geographic location. the word is regressive. Islam is regressive, not conservative. It is redundant. Come back Mary Whitehouse. All is forgiven! I don’t know who’d feel more insulted, Conservatives being described as terrorists or terrorists described as Conservatives. Conservative today, moderate tomorrow, in media-speak. Like they have done with Morsi and Rohani. The total loss of meaning is so Orwellian, and, as he and Koestler predicted and saw, so evident among the left as well as the totalitarian right, as to make language into simply a tool for demagoguery. Spot on Akus. The Guardian is the preferred medium for sanctimonious demagogues who parade their snobbery and bigotry through moral inversions that continually excuse the actions of racists and fascists, and condemn those who are the targets of their hatred. If you are asking what is common between HAMAS and other conservatives, like the Tory Party or the Republicans in the US, the obvious answer is all of them want to arm the Al-Qaida in Syria. What a conspiracy nerd. Get your meds, Jimmie Racist. 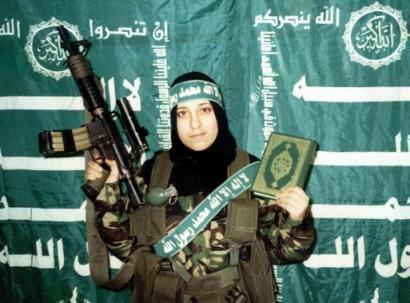 How come no one mentions where the weapon that Hamas lady in the photo is holding came from? William Hague I think supplies that brand. Green paint is thrown all over by the Southern agents for the manufacturers in the Kingdom. Al Guardian tries to sell terrorism as way of life and to integrate it into normal life by labelling terror organisations as conservative. Some idiots buy that, jew hating trolls belive that. According to Judith Butler, Hamas is liberal and progressive. According to Sherwood it is conservative. They should try to get their story straight. Judith Butler; confused but tenured. In 1940 the Haganah sabotaged the Patria, an ocean liner being used by the British to deport 1,800 Jews to Mauritius, with a bomb intended to cripple the ship. However the ship sank, killing 260. Do you understand simple English Adrian? “INTENDED to cripple the ship.” Show one instance of your terrorist heroes “accidentally” killing someone while “intending” to only injure. Pathetic sock-puppeteer. Who are you, coward loser? Are you Jim Jerbyl? Nick-a-Nazi? Snottyville? Moron. Mohamed Atta was also, by Sherwood standards, a “moderate”. He used a very shallow dive and medium speed when crashing the 757 to the north twin tour. How nice and considerable from him. Why does Israel not chuck out Harriet sherwood? Because Israel is a liberal democracy which does not shackle free speech. Thank G-d for that. If she was even a fraction as critical of Hamas as she is of Israel, she would be banned from Gaza in a heartbeat.